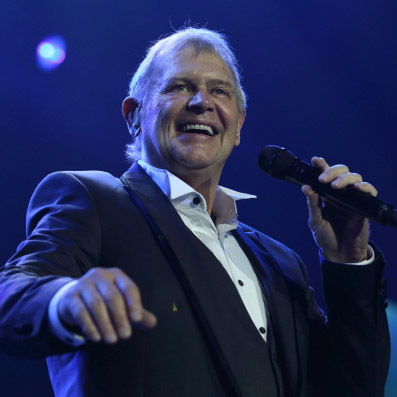 John Farnham is undoubtedly one of Australia’s top performing artists, with a career spanning more than four decades. Born in Essex, England, John immigrated to Australia in 1959 at the age of 10. In 1967 John recorded Sadie (The Cleaning Lady) and decided to leave his plumbing apprenticeship to pursue a career in entertainment. As a result of his recording and performing success John reigned as King of Pop from 1969-1973 releasing 12 singles and six albums that all achieved gold status. During this period he also appeared on stage in the theatrical production of Charlie Girl and explored his comedic talent on television. In 1980 he formed his own band ‘Farnham and Friends’. He also performed the Beatles classic ‘Help’ to critical acclaim. In 1982 he was invited to front the Little River Band and toured extensively in the US. But it was after leaving LRB that John truly came into his own. In 1986 he released his first solo album in six years called ‘Whispering Jack ‘. This phenomenal album continues to be Australia’s biggest selling album of all time by a local artist and for which he was awarded the Outstanding Achievement Award by the Australian Record Industry Association (A.R.I.A). In addition to local success ‘Whispering Jack’ and it’s famous single, ‘You’re The Voice’, was a chart-topping hit throughout Europe, England and Canada. To cap off this wonderfully successful time in John’s career the multi-award winning singer was then named Australian of the Year in 1988. John followed ‘Whispering Jack ‘ with ‘Age of Reason ‘. The album was also hugely successful and the national tour of the same name was extended to Scandinavia, Germany and the UK. In 1992, John sang the part of Jesus in the Australian recording of Jesus Christ Superstar- The Album. He then performed the role in the arena version of the musical with Kate Ceberano, Jon Stevens, John Waters and Angry Anderson. On Australia Day 1996 he was honored with the Order of Australia for Services to Music and Charity. His successful recording career was celebrated further in 1997 with the release of the Anthology Series: I,II and III. In the same year, Farnham was recognised as the Most Broadcast Australian Recording Artist by the Phonographic Performance Company of Australia. ln 1998, he toured Australia with Olivia Newton­John and Anthony Warlow in The Main Event, accompanied by the Farnham Band AND a 40 piece orchestra. The Main Event CD reached quadruple platinum status within four weeks of release. The following yea r Kylie Minogue, Doc Neeson, The Living End and Gina Jeffreys joined John in East Timor for the ‘Tour of Duty – Concert for the INTERFET Troops’. In a first, this was broadcast live in Australia concurrently on both Channels 7 and 9. In 2000 John and Olivia were reunited during the Opening Ceremony of the 2000 Sydney Olympic Games when they performed ‘Dare To Dream’ together. In 2003 in another career highlight ,John was inducted into the Australian music industry’s A.R.I.A. Hall of Fame by long-time friend, manager and fellow inductee, Glenn Wheatley (Masters Apprentices). Throughout his career John has regularly toured both Australian and overseas markets. At home his tours are renowned for breaking attendance records at major entertainment venues or as with the shows at Star City, opening a new state of the art show room that will become a destination venue for top performer’s. and then coming full circle with the 2011, John Farnham Whispering Jack 25 Years on Tour. His most recent Tour, this year, with Lionel Richie had John receiving some of his best reviews to date. John’s love of performing was simply summed up when he said “I am happiest when I’m on stage”. Here’s to his continued happiness.